Accepting a PND diagnosis can be difficult, it takes time to comes to terms with it, but know that time is the biggest healer, it doesn’t make things go away but time gives us the strength to cope with things better. You are a wonderful mum and in time PND will fade into the background and you will be able to see that for yourself. Make the time to give yourself time! Its important to give yourself time, recovering from pregnancy and birth are a challenge in themselves, recovery from Postnatal Depression wont happen overnight, but you can and will get better, but it will take time and if you give yourself permission to have that time to get better, then you are one step closer to recovery. Concentrate on the little things that make you smile on your darkest days and hold onto those memories for whenever you feel low. There is always a positive in your day, you just have to slow down (there’s that time thing again!) and notice these things, it could be as small as seeing a picture that makes you smile, or a friend stopping by to say hello, and for me getting the dishes done! Time to look after yourself whether its a long bath or reading a book, or going for a walk in the fresh air, taking time for you each day is really important, doesn’t have to be a big thing but do something just for YOU every day, something that helps you reconnect with who you are. Wherever you are on your journey to PND Recovery – Say to yourself it is always ok take good care of YOU. Whether that means taking time away from social media, or enjoying a night away from the family! Really take the time listen to your mind and body are telling you – if you feel things creeping back in – talk to someone, see your GP – notice who or what has a negative impact on your mental health and step away from those things if possible. Taking the time to take care of YOU is incredibly important. As the days go by you will see that the good days are slowly outweighing the dark days. time is what you need to get better, so take it one hour at a time if you have to. 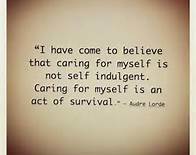 As the quote above says ‘Caring for myself is an act of survival’ So the next time you do something for yourself, don’t feel guilty! Think about it as part of your survival – your recovery – your future.